On today's episode of Should I Start a Podcast we talk all things long term vs short term. We all know it's easy to see the pleasure of a short-term gain. Buying that cool wallet off Amazon will feels good, tasting the juicy flavors of that big mac as it slides into your mouth is amazing. But while those types of short-term decisions make us feel good in the moment, long-term, they’re not as good for us. Giving up those quick fixes is challenging and doing things for long-term gains can often be even harder. Where do we even start? 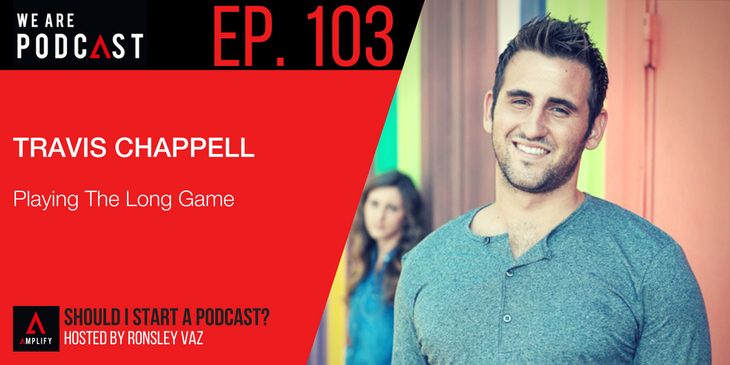 This is where our guest, Travis Chappell gives us incredible insight. Travis has had some amazing pay off with long term focus, you could even call him the king of long-term goal setting. At 22 years old made his first six figures and he shares with us an in-depth chat about delaying gratification to get more significant gains in the future. How certain personality types are more prone to long-term benefits than others. Travis believes that anyone can train themselves in the discipline of putting off short-term pleasures for long-term goals.